Functionality and design always come together. Each room or space has its own purpose – depending on how I interact with the space on a daily basis. 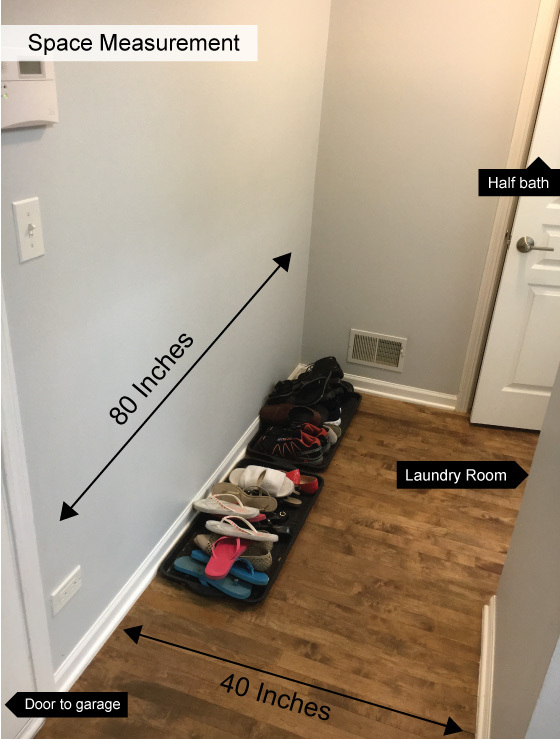 We have a narrow and small hallway that connect to the garage door, a laundry room, basement, and a half bath. It’s a very busy area. 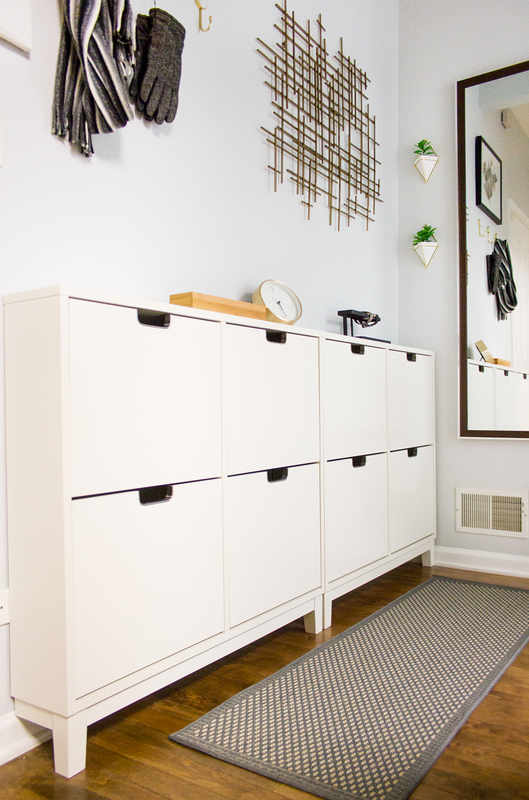 My plan for this hallway was to store shoes and hang coats and jackets that are in use for the winter season. And also to have a place where I can see my outfit before I step out of the house. 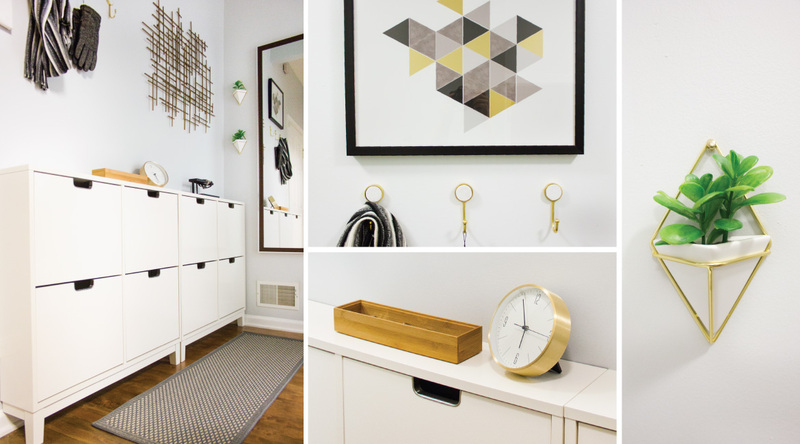 Must-have items: Shoe storage, full length mirror, key holder, and hooks. 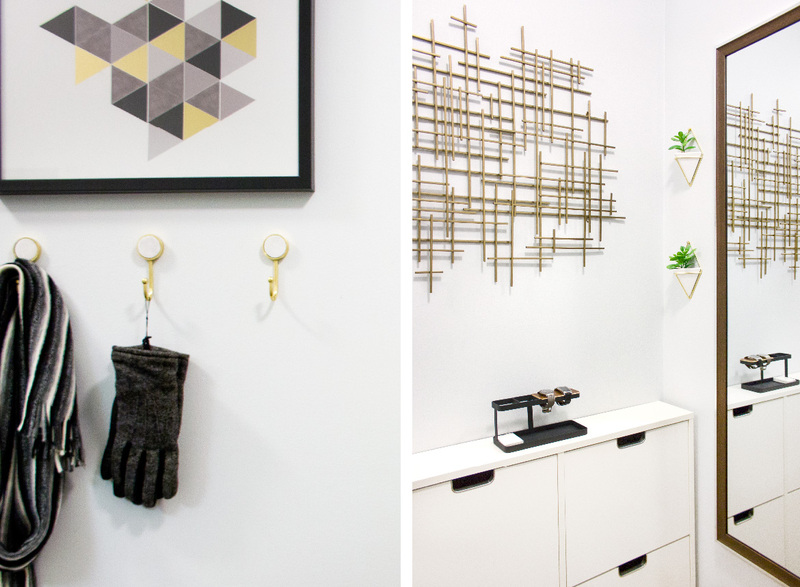 The challenge is to get all the must-haves into this small space. I made a quick sketch on a post-it note, that was the only paper I have at the time:) I started with main items (shoe cabinet, full length mirror, hooks). 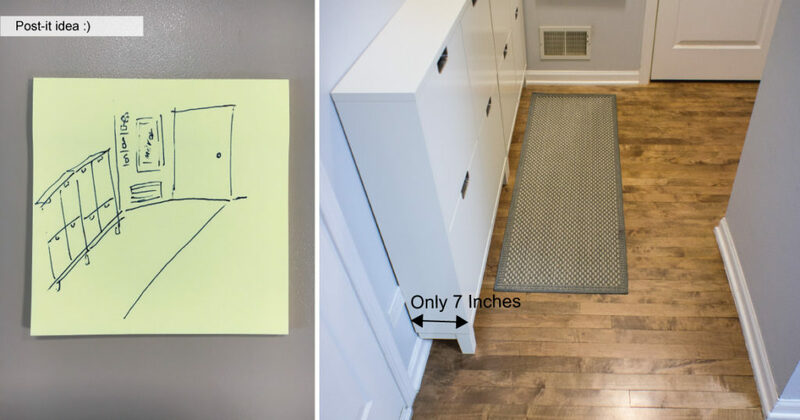 I know I wanted to place a shoe storage against the longest wall. The full length mirror will be hanging on the other wall over the air vent. So my search for the thin shoes cabinet began. 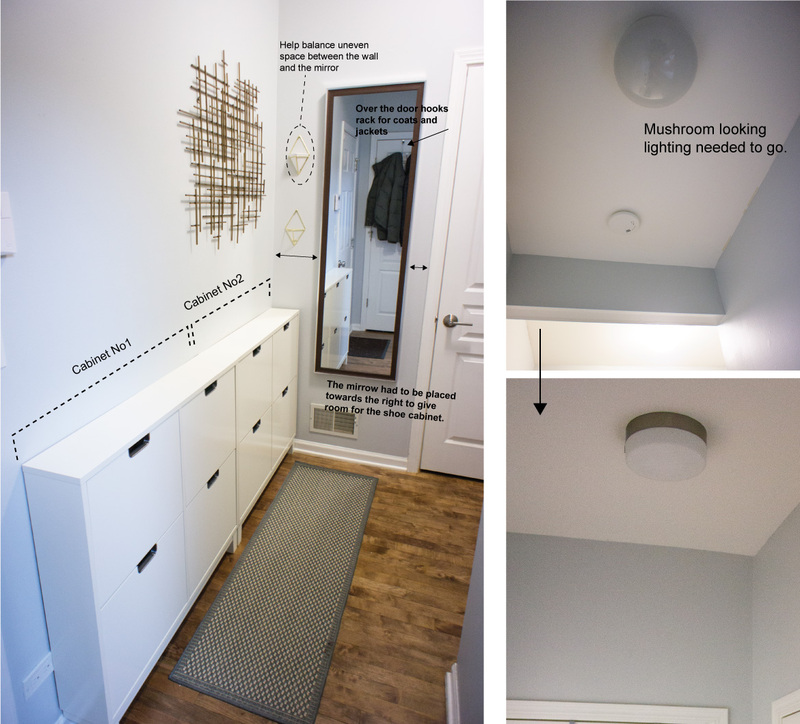 Ikea Stall shoe cabinet has the prefect depth and it’s only 7 inches! I added 2 sets to the wall. It filled the space nicely. Next, the full length mirror that will go on this wall had to be a little bit narrow because the width of the wall is only 32.5 inches. Luckily I found the mirror I needed at Target. I like how the mirror has metal edge around the wood frame. The mix between the two materials feel sleek with the metal and yet warm because of the tone of wood. The width of the mirror is 18 inches, a perfect size for the wall. 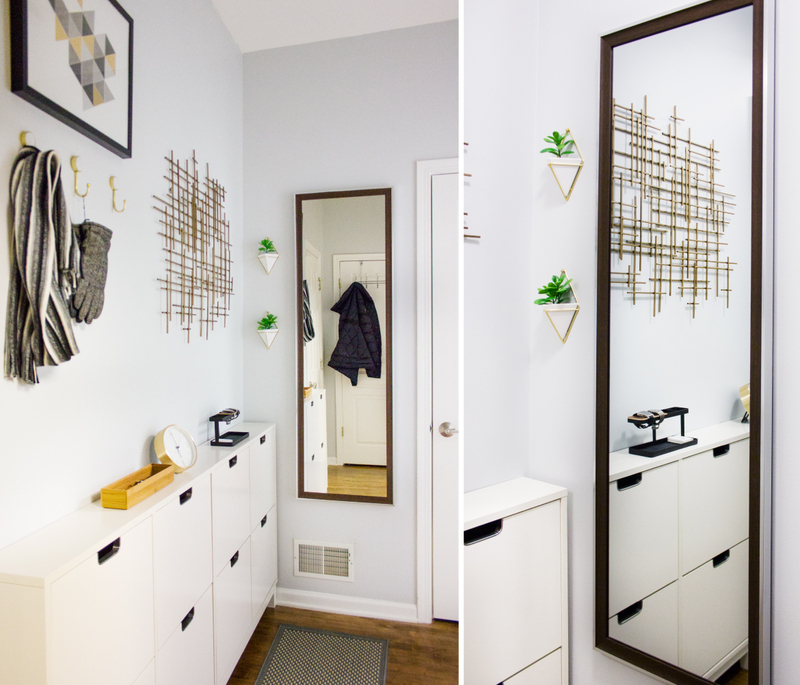 The placement of the mirror have to go off to the right, not in the center of the wall because of where the shoe cabinets are. So that created an awkward space. I filled that awkward space with 2 wall vases. It helped balance the wall and also was a good place to add some greenery. The lighting is also an important part of the room. It can set the mood of the space and reflect color on the wall. Before, we had a flush mount lighting that look like a mushroom with yellow tint lighting. We replaced them with a modern style and a simple shape. Small hooks to hang small items like scarf, hat, or gloves had been added above the shoe cabinets. This is beautiful! May I ask where the clock is from? Thanks Brandon 🙂 The clock was from Target. Looks great. Attractive and, most importantly, functional for multiple people. 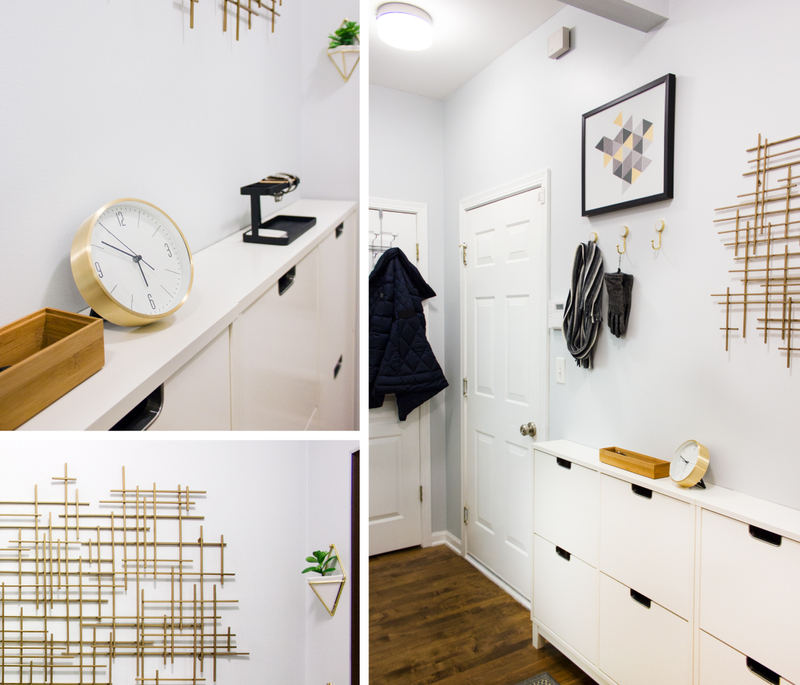 I like the sensible touches like the clock, mirror, tray for keys or change, places to hang coats or stash shoes and accessories away. I like the artwork, too. That’s the thing I like most about your dining room. Personal artwork, meaningful to the diners. Good job! @2019 - DELIiSH&DeCOR. All Right Reserved.